“Everybody say, ‘Yeah, Yeah,” encourages the charismatic Sahr Ngaujah as Fela Kuti. The audience repeats the phrase in mumbles. Undiscouraged by the reluctant audience, he says it again and this time encourages us all to “leave our shy outside.” We are at a concert, allowed to dance and have an awesome time. Catherine Foster, Sahr Ngaujah and Nicole de Weever in FELA! Photo by Monique Carboni. It is the late 1970’s. Lagos, Nigeria. We are witness to the final show of legendary Afrobeat creator Fela Anikulapo-Kuti at his club The Shrine. Anything goes at The Shrine and we are all witness to the extraordinary life of Fela. The show, directed and choreographed with great energy by Tony Award-winning Bill T. Jones, tells how Fela, inspired by his civil rights advocate mother, Funmilayo, spends most of his life fighting the corrupt government of Nigeria. He does it all with sounds, declaring his “music as a weapon.” In 1958, he moves to London to study music and formed his band, influenced by the sounds of James Brown, Frank Sinatra, jazz and Afro-Cuban beats. After relocating to Los Angeles, Kuti becomes friends with Sandra Iszadore (a magnificent Paulette Ivory) who exposes him to the Black Power movement. Fela returns to his homeland determined to make a difference in the lives of those oppressed by the Nigerian bureaucracy. Kuti’s life was remarkable and could rival that of any rock star today. Nights at his club usually stretched into the wee hours of dawn. He was notorious for smoking igbo, drinking, and being surrounded by scores of women, who he called his Queens. He eventually married them, all 27, on the same day. A raid of his compound, Kalakuta, which he had declared to be an independent state, resulted in the death of his mother and injuries to him, his Queens, his friends and band mates. Produced by Shawn “Jay-Z” Carter and Will and Jada Pinkett Smith, FELA! is a non-stop, heart pounding, hip shaking, live jam session. The first Act is all hip-swaying, gyrating, pelvic thrusting, and booty-shaking. These dancers show that there is an actual art form to shaking your hind parts. The audience is encouraged to stand and shake their own to thunderous drum beats and Ngaujah’s voice chanting time on the clock. “One o’clock.” Shake. “Two o’clock.” Shake. “Three o’clock, four o’clock, five o’clock. Shake. Shake. Shake. FELA! 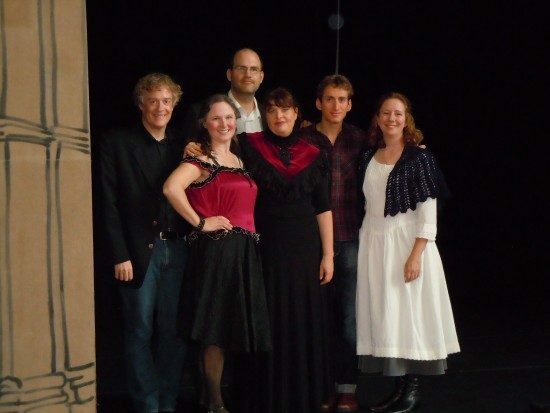 on Broadway Ensemble. Photo by Monique Carboni. Act Two is a bit milder, but with reason. The death of Fela’s mother was devastating to him, and it transforms him into a man with perhaps nothing to lose. His call to the Ancestors and the spirit of his mother are bathed in a set of UV lighting with an ensemble in massive head pieces, all-white suits and dresses. The voice of Funmilayo – a phenomenal Melanie Marshall – is forever present throughout the show. Marshall’s singing on “Trouble Sleep” and “Rain” was ethereal. She has a voice of a goddess, perhaps even the Ancestor to which she was singing about. It was breathtaking to watch her simply stand or sit and just sing. Paulette Ivory – who plays Fela friend and collaborator Sandra Izsadore – was stunning and her voice was angelic. Her singing with Sahr on “Lover’ and “Upside Down” was thrilling and gorgeous. To add to this thrilling night – I was in awe when the real Sandra Izsadore appeared at the curtain call and hugged Paulette Ivory. It gave me chills. Marina Draghici’s Set Design is full of elaborate colors, an array of bright eye pleasing colors. Three screens hang on the left, right and center of the stage, and serve as a historical backdrop to the happenings at The Shrine. Fela’s return to Nigeria is chronicled with video footage. After the raid, the screens go black, flash a picture of a victim, and a type-written explanation of how they were treated by one of the 1,000 soldiers who descended on Kuti’s home. The cast is clothed in an array of lime greens, crimson reds, sun-kissed yellows and burnt orange. Marina Draghici’s designs flow effortlessly around the bodies of the mutli-talented ensemble. The show wouldn’t have worked without that outstanding band, lead by Conductor Aaron Johnson – who also played trombone and keyboards. Each drum beat, bass drop, guitar strum and congas sound forced me to shake those narrow hips of mine. There is no way to attend this show and not move. It’s infectious. 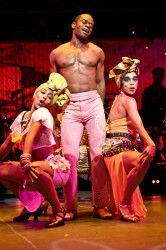 Sahr Ngaujah as Fela Kuti and the Broadway cast of FELA! Photo by Monique Carboni. Sahr Ngaujah, recreating his Tony-nominated performance, is a whirlwind of energy, and is convincing playing the saxophone player. [Actually it is Morgan Price’s ‘hot sax’ that we hear thoughout the show] Sahr’s performance is one for the ages. You have to see it to believe it! FELA! is a must see! I wanted to dance and sing along and laugh the entire night. It didn’t hit me that the show was over until I was driving home. What a way to end the night! It wouldn’t be fair to categorize FELA! as a play or even a musical. This is a show with a life of its own. There is nothing around that is anything like the production of FELA! I’m sure of it. Go buy a few tickets and enjoy the last concert of a legend. Running time: 2 hours and 20 minutes, with a 15 minute intermission. FELA! 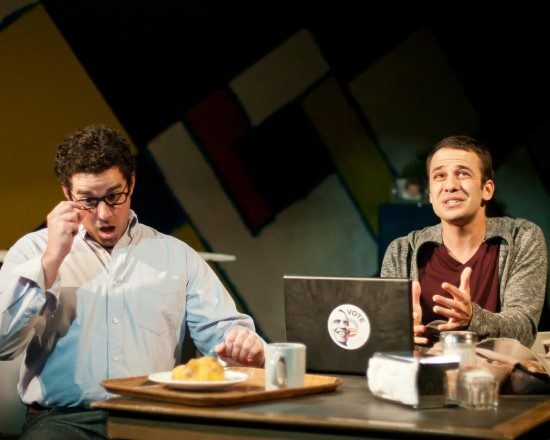 plays through October 9th at Shakespeare Theatre Company’s Sidney Harman Hall – 610 F Street, NW, in Washington, DC. For tickets, call (202)547-1122, or purchase them online. Ashunda Norris is a storyteller, poet and English teacher. A graduate of Paine College and Howard University, Ashunda has a Bachelor’s and Master’s degree in English. While teaching middle school English, she realized her true passion was creative and journalistic writing. Writing reviews for the Maryland Theatre Guide keeps Ashunda from pulling out her hair due to the high stress level of her day job. She has written a few short screenplays and is currently working on a full-length script, a novel and a collection of poems. When she is not teaching seventh graders the wonders of manners and a smile, Ashunda can be found on a stage reciting poetry, in a movie theater digging into a purse full of snacks or with a book in her face.